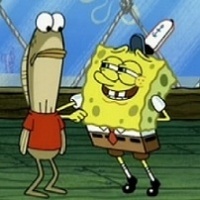 Frank (Red Shirt Fish) – From SpongePedia, the biggest SpongeBob-wiki in the world! 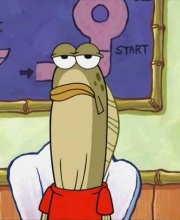 Frank is a minor and cameo character in the SpongeBob SquarePants series. He appears mostly from the 4th Season onwards. In the episode Gullible Pants, SpongeBob says that the red shirt fish can have the job as fry cook, when Mr. Krabs leaves the Krusty Krab, after his nail splits. Not to be confused with Frank (Cameo Character), Frank (Muscular Goldfish), or Frank (Prison Guard). Frank has a long olive-coloured head. 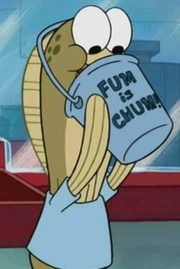 He always wears a red shirt, Blue Jeans & Green Nike Sneakers except in the episode Chum Bucket Supreme, in which he accidently wears a blue shirt. Throughout the series he makes subtle hints that he loves to spend more money than offered prices for very small items. He carries a tape recorder as seen in Boating Buddies. This page was last modified on 31 January 2015, at 16:14.